What is a MCC Retrofit? What is a Motor Control Center Retrofit? A "retrofit" motor control center includes brand new starters, circuit breakers, control power transformers, relays and pilot devices that are assembled, wired and tested into an original motor control center unit. Egan-Wagner Corporation (EWC) only uses new UL labeled components, not-refurbished, not re-built. They are new, factory warranted products and are not 'counterfeit'. Egan-Wagner Corporation is an authorized OEM for all major brands. Occasionally a customer requests refurbished or after-market components and we try to accommodate their request but always with full disclosure. Vintage buckets are obviously not in production therefore EWC will clean up the bucket sheet metal and stabs, including re-wiring the stabs if necessary. 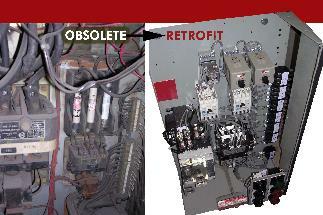 EWC has been retrofitting MCC units since 1993. All types of MCCs are expertly retrofitted including Allen-Bradley, Allis-Chalmers, A.O. Smith, Clark, Cutler-Hammer, Federal Pacific, Furnas, General Electric, ITE, Klockner-Moeller, Nelson, Powell, Siemens, Siemens-Allis, Sylvania, Square D and Westinghouse. A new handle resolves safety issues. Safety -- Proper operation of new operating handles and overload resets restores personnel protection. Reliability -- New devices improve reliability and result in fewer breakdowns. Ease of Installation -- Custom schematic and wiring diagrams exactly match existing units facilitating retrofit change-outs. Fast -- Speedy delivery of retrofitted units meets critical project schedules. Minimal Down-Time -- Retrofits eliminate the need for an extended outage resulting in much less down-time than installing a new MCC lineup. What Are Your MCC Retrofit Options? Customer supplies buckets from spares or unused units. EWC retrofits these buckets and returns them to the customer. Customer has empty spaces only and no spares. EWC provides buckets from our inventory, retrofits, and sends them to the customer. Customer has no empty spaces and no spares. All buckets are in use. EWC provides Seed buckets from our inventory, retrofits, and sends them to the customer for installation. Customer pulls out existing unit, replaces with retrofit, and sends just pulled bucket to EWC. Customer wants to perform some on-site work themselves or there are no available buckets for their obsolete MCC. 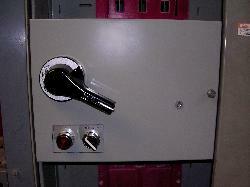 EWC provides BackPanel already assembled, wired and tested for on-site installation. No buckets leave their facility.